The BMW E30 is an entry-level luxury car which was produced by BMW from 1982 to 1994. The initial models used the coupe (two-door sedan) body style. Four-door sedan models were introduced in 1983, convertibles were introduced in 1985 and estate (Touring) models were introduced in 1987. The BMW E30 is an entry-level luxury car which was produced by BMW from 1982 to 1994. The initial models used the coupe (two-door sedan) body style. Four-door sedan models were introduced in 1983, convertibles were introduced in 1985 and estate (“Touring”) models were introduced in 1987. The E36 replaced the E30 coupe models in 1990, with other E30 body styles being phased out of production until the final E30 model, a Touring, was produced in 1994. While drag races are far from being exciting and often times, they’re extremely biased, yet they’re perfect for bragging rights and killing time. The E30 3-series was penned by Claus Luthe in 1978, the designer of the NSU Ro 80. Externally, the E30's appearance is very similar to twin headlight versions of its E21 predecessor, however there are various detail changes in styling to the E30. Major changes over the E21 include interior features and revised suspension (to reduce the oversteer for which the E21 was criticised). As per the E21, a Baur convertible was available. Unlike its predecessor, the second generation 3 Series was available as a four-door saloon as well as a two-door saloon, and there was later a five-door estate model. The primary distinctive feature of the BMW E30 models produced for the North American market in 1984–1987 are the elongated front/rear aluminum bumpers. These bumpers are commonly known as "diving boards." 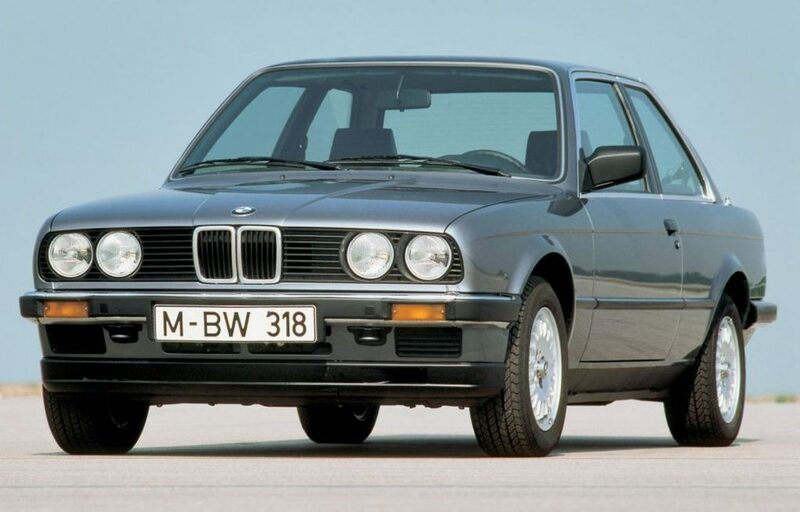 At Frankfurt in September 1987, BMW introduced a major update to the E30 (often called "Series 2"). The changes to the lineup were the addition of the Touring (station wagon) variant and removal of the 325e model. The M10 4-cylinder engine was replaced by the M40. External styling changes included a new front bumper, redesigned rear lights, rear apron, headlight reflectors, and licence plate frame, while the window frames lost their chrome trim. Rust protection was improved with the update. Various mechanical changes were made, including updating of the engine range. In 1988, the anodized aluminum bumpers for the North American market were shortened by revising the cover/fillers and shortening the shocks. In 1989 (again, for North America) the aluminum bumpers were replaced with shorter plastic bumpers in body-colour. Aside from USA models, the 1987 update models remained largely unchanged until the end of production. In South Africa, only the coupes and sedans were built, four cylinder gasoline (petrol) models production continued there until 1992. The total production from 1982 to 1994 was 2,339,520 units. Following on from the E21, at the launch of the E30 range in 1982 it was fitted with the M10 straight-four and the M20 straight-six engines. Over the production run, the M10 was replaced with the M40 and M42, the M20 received various upgrades and the BMW S14 engine was introduced in the M3. A six-cylinder diesel was also introduced later, originally only in naturally aspirated form. At the launch of the E30 range in 1982, the 316 used a 1766 cc M10 fed by a carburetor and producing 66 kW (90 PS; 89 hp), this engine allowed BMW to offer a cheap, entry-level car in the range. The 318i had the same M10 engine, but with Jetronic fuel injection, pushing power to 77 kW (105 PS; 103 hp) while also improving fuel economy. The 1987 "Series 2" update introduced a new four-cylinder SOHC engine, the 1796 cc (M40B18) with 85 kW (116 PS; 114 hp). This engine incorporated Motronic fuel injection . The 316 was replaced by the 316i, which used a 1596 cc M40B16, producing 75 kW (102 PS; 101 hp). This was not quite as torquey as the 66 kW (90 PS; 89 hp) 1766 cc M10 it replaced - nevertheless, it offered superior performance overall. In South Africa and perhaps some other markets, the old M10-powered 316 continued until 1991, gaining the new bumpers when the range was updated. The 316i model (and previous 316 model) was not sold in Australia, where the base model continued to be the 318i. The 318iS coupe was released in 1989, soon followed by the 318i sedan and 318iC convertible. These models introduced a new engine, the chain-driven DOHC M42 1.8 L 16-valve engine w. This is the most modern engine available in the E30 range, incorporating the updated Bosch Motronic 1.3, hydraulic valve adjusters and four individual coil packs which resulted in a very high hp per litre as well as reasonable fuel economy (33mpg) and CO2 emissions (190 g/km). The excellent weight distribution of the 318iS & 318ic has led to frequent comparisons with the famous E30 M3. Nicknames include "mini M3" or "poor man's M3." The M3 is powered by the BMW S14 engine, a high-revving motorsport engine. At the launch of the E30 range, the 320i (2.0 L M20 with 92 kW (125 PS; 123 hp)) and 323i (2.3 L M20 with 105 kW (143 PS; 141 hp)) were available, both using Bosch L-Jetronic fuel injection. These models were not sold in North America, presumably for emissions reasons. In 1985, the 323i was replaced with a 2.5 L version of the M20, which produced 126 kW (169 hp) and used Bosch Motronic fuel injection. This engine was available in the 325i variants (including the all-wheel drive 325iX). An economy version called the 325e (the e signifying efficiency/economy) was released as a lower revving, more fuel efficient engine. To maximise low-rev torque, the engine was the largest available in the chassis (aside from the rare South African version which was available with the 3.2 L M30). The 2.7 L had a longer stroke than the 2.5 L, with a more restrictive head, four cam bearings instead of seven (less internal friction), and single valve springs where the 2.5l had doubled up springs. This resulted in 90.22 kW (123 PS; 121 hp) at 4250 rpm and, more importantly, 240 N·m (180 lb·ft) at 3250 rpm (peak torque for a 325i is 215 N·m (159 lb·ft) at 4000 rpm). The 1987 "Series 2" update boosted the 320i to 95 kW (129 PS; 127 hp) and the 325i to 126 kW (171 PS; 169 hp) and improved fuel economy. In 1985, BMW introduced the 324d, which has the 2443 cm3 M21 diesel inline-six with swirl chamber injection; it produces 63 kW (86 PS). 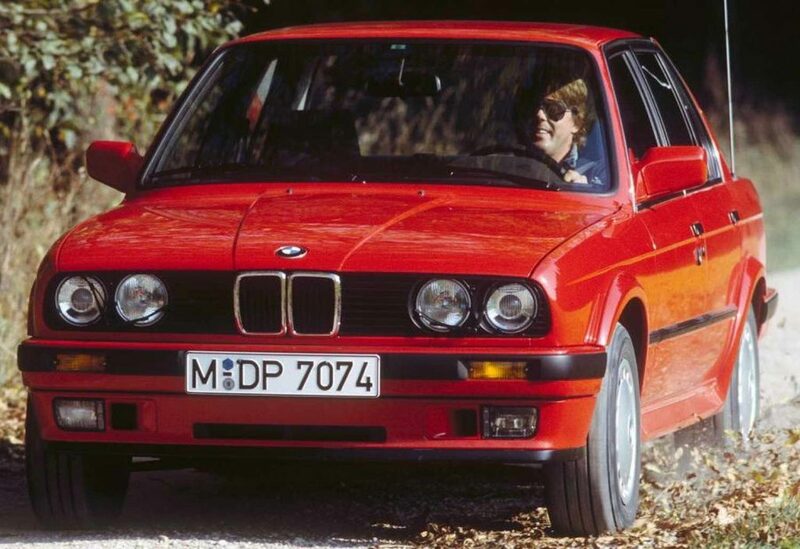 In 1987 a turbocharged version called the 324td with 85 kW (116 PS) arrived. This model also has an all-new electronically controlled injection pump (DDE) developed by Bosch, which provides higher power and smoother running. One of the features that added to the roominess of the E30 was the suspension. The front MacPherson struts and rear semi-trailing arm suspension were a compact arrangement that left a lot of cabin and boot space for the car's overall size. The semi-trailing arms have been criticized for the dynamic toe & camber changes inherent to the suspension geometry, causing bump steer in hard cornering situations (such as racing and autocross). This has contributed to the E30 as having a reputation for "tail happy" handling, where rear grip is reduced in certain situations, leading to oversteer. A widened version of the E30 front suspension and the drivetrain from the E30 325i were used in the BMW Z1 roadster. The BMW Z3 (E36/4) and BMW Compact (E36/5) rear suspensions are also very similar to the E30, but utilizing five-lug hubs. The BMW M Coupe uses a widened version of the same rear semi-trailing arm suspension. In total, eight transmissions were available for the various models of the E30: five manuals, and three automatics. The standard gearbox for the 316 and some 318i models is the Getrag 220 4-speed, these models had the option of the 5-speed Getrag 240. The Getrag 220 does not have synchromesh on reverse. The 5-speed 318i models use the Getrag 240 gearbox. This gearbox is also used on the 320i, however with a different bell housing to suit the M20 engine. The 323i, 325e, 325es and 325i use the stronger Getrag 260 5-speed. Some European market facelift M20 cars (320i and 325i) were also available with a ZF manual transmission, however this was not a listed option, or specific to any particular market or factory, and is thus very rare to find. The M3 was fitted with a Getrag 265 five-speed manual gearbox. This featured a dogleg shift pattern for European models and a standard H-pattern for North American models. Both automatic transmissions were manufactured by ZF - they were the 3-speed 3 HP 22, which was available on the M10 316 and 318i models until year 1985, and the 4-speed 4 HP 22, which was available on all models later. 320i and 325i have the option of the sport automatic, that was an electronic box rather than the usual fully mechanical box. This is much less common to find in USA than Euro market cars, though it is still fairly uncommon in Euro market cars too. There are a number of options for the gear ratio for E30 differentials, with an optional limited-slip option. All E30 differentials, small case or medium case, are interchangeable. The E28 5-Series and E24 6-Series shared the same differential, and can be used in the E30 after swapping the rear cover and output flanges. This provides options for ratios such as 3.25 and 3.46 that wake up the 325e, or provide a proper final drive ratio for engine-swapped cars without overdrive. 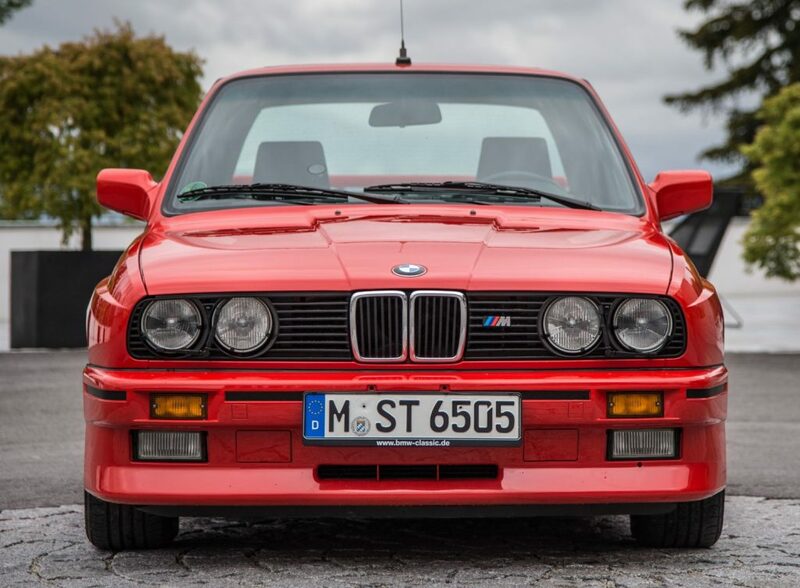 The BMW M3 utilised a widened and heavily redesigned variation of the coupe body style, therefore the M3 shares few body parts with other E30 models. The M3 suspension is also significantly different from regular E30 models, including 5 lug wheel bolts. The E30 M3 used the BMW S14 inline-4 engine. The first iteration of the engine produced 143 kW; 192 hp (195 PS) with a catalytic converter and 147 kW; 197 hp (200 PS) without a catalytic converter. In September 1989, power was increased to 158 kW; 212 hp (215 PS) with a catalytic converter. The sportier “Evolution” model (also called “EVO2”) introduced in 1988 produced 160 kW; 220 hp (220 PS). Other changes included larger wheels (16 X 7.5 inches), thinner rear and side window glass, a lighter bootlid, a deeper front splitter and additional rear spoiler. A more powerful and lighter “Sport Evolution” model (sometimes referred as “EVO3”) with a limited production run of 600 units increased engine displacement to 2,467 cc (2.5 L), which produced 235 bhp; 175 kW (238 PS) at 7,000 rpm and 240 N⋅m (177 lbf⋅ft) of torque at 4,750 rpm. Sport Evolution models have enlarged front bumper openings and an adjustable multi-position front splitter and rear wing. Brake cooling ducts were installed in place of front foglights. An additional 786 convertibles were also produced. In addition to the famous M3 there were other special models of the E30. For Portugal, Greece and Italy only, due to considerably higher VAT and vehicle tax for cars with engines exceeding 2000 cc, a special model was created: the 320is. The sedan version appeared in the dealers' showrooms in September 1987 while the coupe version arrived in March 1988. This model was produced both in coupe and sedan versions and was equipped with a 2.0 L (1990cc) version of the S14 engine from the M3, with stroke reduced to 72.6 mm (2.9 in) and a power output of 192 hp (143 kW). The 320is shared the same dogleg Getrag 265 gearbox of the non-US M3 while it had a limited slip differential with the same 25% lock up rate but with a closer ratio. All the 320is models were left hand drive and without a catalytic converter. Sports suspension was fitted to all coupes, and to sedans produced from September 1989. The interior of the 320is was identical to that of other 3 Series models, except an M3 instrument cluster (which features an oil temperature gauge instead of a fuel economy gauge) was used. The 320is was sold for three years, with 1206 sedans and 2542 coupes being produced. In New Zealand, where the M3 was never officially sold, the local importer created a sporting version of the sedan called M325i. About 100 such cars were imported beginning in late 1986 until at least 1990. Fitted with the standard non-catalyzed 171 PS (126 kW) 2.5 litre engine they benefitted from a Motorsport fettled suspension, the M-Technic body package, 15-inch BBS cross-spoke wheels with wide, low profile (225/50) tyres, and a limited-slip differential. The M325i is quite similar to the British market 325i Sport, also developed as a response to the absence of a right-hand-drive M3. BMW South Africa's Motorsport division created the 333i in 1986 by fitting the 3.2 L M30 "big six" engine to a coupe E30. The resulting 333i was a success in South African saloon car racing. These cars were built with help from Alpina in Buchloe, Germany. Due to the space constraints caused by the large M30 engine, the buyer was forced to choose between air conditioning (vital in South Africa) and power steering. Only 204 of these cars were produced. The 333i produces 145 kW (194 hp) at 5500 rpm and 285 N·m (210 lb·ft) at 4300 rpm. Official performance claims are 0–100 km/h in 7.4 s and a top speed of 228 km/h (142 mph). The 2.7 litre 325iS (commonly called "Evo 1") was created by BMW South Africa to replace the 2.5 litre 126 kW 325i in Group N production car racing, as a response to the introduction of the Opel Kadett 2 litre 16V to the Class A category. It was launched in the first half of 1990 and was powered by an Alpina-fettled, 2.7 litre M20 engine which produced 145 kW (194 hp). BMW claimed a 0-100 time of 6.9 seconds and a top speed of approximately 230 km/h. The 325iS used aluminium doors, fenders and bonnet and was fitted with the 5-stud race-tuned suspension from the European BMW E30 M3 (which was not sold in South Africa). Following the introduction of the upgraded Opel Kadett 16V SuperBoss, in 1991 BMW South Africa introduced the 325iS Evolution HP (commonly referred to as the "Evo 2"). The motor was upgraded to produce 155 kW (208 hp), due to improvements to the induction system, increased compression ratio, an upgraded cylinder head, an increased rev limit and a revised exhaust system. Despite the increased power, BMW's official performance figures were unchanged over the 325iS. The Evolution HP was equipped with a front splitter/underbody tray to aid high-speed under-floor aerodynamics. The aluminium panels were no longer used, due to cost and repair-ability issues. The differential ratio was shortened and shorter springs were used in the front suspension. The Evolution HP won the Group N Class A title in 1993, winning 20 of the 24 races and setting several lap records in the process. The Robbi Smith and Geoff Goddard Evolution HP won the season-ending 9hr race by 10 laps. The JPS Edition is an Australian-only model built as a tribute to the 635CSi cars competing in local touring car racing. The JPS in the name refers to the sponsor of the race cars, John Player Special cigarettes. The cars are based on a 323i coupe and are coloured black with gold pinstripe and gold BBS wheels. Other features included Recaro sports seats, JPS badging, a limited slip diff, sports suspension, sunroof and unique body kit. The number of JPS cars produced is unknown, however it is speculated to be over 70.